Ledbetter Insurance has been providing car insurance for Milwaukee, Wisconsin residents since 1988. We offer automobile coverage from minimum auto liability limits to high physical damage insurance on expensive antique autos. As an independent agent we can select from one of our many insurance companies to find you the best coverage and rate. Combine your home and auto and save even more with a multi-policy discount. Several discounts are available, multi-auto, mature driver, safe driver, good student and more. 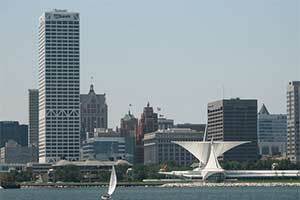 Milwaukee is the largest city in Wisconsin and is located on the southwestern shore of Lake Michigan. Originally inhabited by Native Americans, Milwaukee is most likely derived from the Ojibwe word “ominowakiing” meaning Gathering Place by the Water. Alexis Laframboise is considered to be the first European resident of the Milwaukee region from 1785. French-Canadian explorer Solomon Juneau came to the area in 1818. Juneau’s town, Juneautown, later merged with two nearby towns, Kilbourntown and Walker’s Point, to incorporate the City of Milwaukee in 1846. Milwaukee is well known for its brewing traditions and also has five US Navy ships named after the city. During many of the early years, the name was actually spelled “Milwaukie” until a newspaper started publicizing “Milwaukee”. The Milwaukie spelling continues on today in Milwaukie, Oregon, which was named after the Wisconsin city before the spelling changed.